Shubham Singh, an ace engineer from BMS College, Bangalore has become the hope of many poor children. His NGO Gramiksha aspires to endorse education and culture among the poverty-ridden and ignorant zone in India. Gramiksha has 6 operating centres in different cities across India. They teach poor children, distribute books, install medical facilities and organize activities and workshops. The team comprises of students and graduates from various schools and universities. Shubham is also working on developing sustainable material out of waste Bio-mass. He was also invited by Queen Elizabeth while he was doing his Masters from Imperial College. Q.1: When did you decide to work for society? It was in a conference call, when I introduced this idea to some of my friends. What came of the discussion was -Shiksha, a group aimed at providing education to children in rural areas. Over a period of time and with many new ideas, Shiksha grew into GRAMIKSHA, with bigger dreams and higher hopes. We started with a seven-day project in a small village Nithera in Northern India during the summer of 2011. It was after this visit that I savored the inner peace out of serving someone. From then until now, I’ve never looked back. Q.2: When did you start with Gramiksha officially? After our first project, my friends and relatives suggested that I make my project official to make a bigger impact. Without Gramkisha we were just bunch of guys who would teach young kids for hobby. People didn’t take us seriously. However, to help children on a bigger level, we decided to register our-self as an official NGO. Q.3: What were the problems you faced in coming up with Gramiksha? Well, there were many problems. Firstly, a number of friends who had supported me until now backed out. People are alright with doing social work temporarily, but are reluctant to commit themselves to it. Secondly, while I was running around government offices for registration, I got a firsthand experience of corruption. Everyone wanted to snack on our cost. Finally, after all the hassle, when Gramiksha became official, I found myself standing alone without any support. But as they say, All’s well that ends well. My sister and cousin came on board with me, stood with me throughout and it was because of their support that I could continue the hard work. Q.4: How difficult was it to manage studies and social work? It was not at all difficult. I believe that the only difficulty that lies between you and your goal is your desire to do it. If one desires to do something, nothing can prove an obstacle. I kept working for Gramiksha since my first year of engineering and always scored the highest CGPA. It never proved a hurdle in any of my undertakings. Q.5: What goals did you set at the beginning and how far have you come since then? In the beginning we focused mainly on environment and health awareness. But learning is a two way process. The more we interacted, the more we got to know about students’ problem areas. Now we try to incorporate extra curricular activities, personal and social quality development, street education and health maintenance in our projects. We’ve also started with teachers’ training programs which is where the real education lies. Q.6: How do you manage to remain updated with the latest innovations in the field of education? The best resources we have to keep us updated, is our team members as they come from diverse backgrounds. We have people coming from Cambridge University, University College London, Imperial College London, Tata Institute of Social Sciences, Azim Premji University etc. who contribute in brainstorming sessions wherein we frame and develop new projects. We also get support from government bodies like the MP Educational Board. This helps us to align our goals with the government’s objectives. For instance, Project Udaan is based on the guidelines of the Right to Education Act. Being connected to such organizations helps us get a clear picture of the needs of society. Q.7: What reactions do you get from the teachers and students when you get to teach them? All classes have almost the same pattern of students’ interest. First benchers remain very excited for learning new things, and the interest keeps on decreasing with increasing rows. Last benchers are usually difficult to tackle in class but they are usually very good at sports. That’s the best thing about project UDAAN, students get a fair chance at every activity so that they can identify their interests. With teachers also, the reactions vary. Some teachers actually remain very dedicated for students’ education while some just don’t care. The level of education varies accordingly at the institutions. Q.8: What are your future plans for Gramiksha? Gramiksha still has to grow a lot. Our team has been working on finding the reasons for students leaving their schools. Various problems came across through our Street Meet project. We’re looking forward to work out ways of rectifying these issues. We also plan to launch Gramiksha as a fulltime NGO. We’ve been working part-time till now, but it’s time to take the next step. Q.9: What is your message for the young generation? 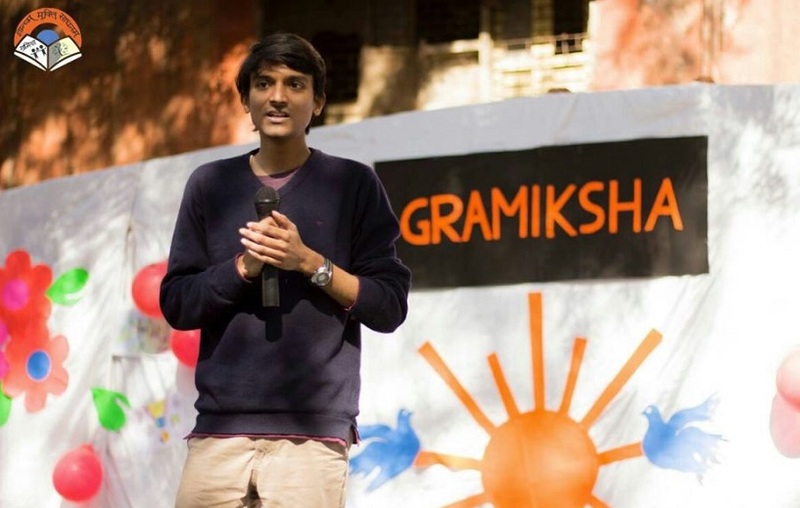 Gramiksha is just one example of a particular group of people who shared the same dream. I have learnt that it is possible to make your dreams come true. What you need to do is to come out of your shell, take a stand and turn your thoughts into action. The rest will eventually be taken care of. Like I said, I believe we have the right to complain; but we all have the power to change, which in the end is more constructive. Wanderlust infected, Travelholic, In love with my life and more than that with the life around me. Hopeless romantic, Nature appreciation is an obsession and Icecreams make me super happy.